The solid, clean lines of the Arts & Crafts movement are interpreted for modern times in the Ameillia Dining Collection by Homelegance. 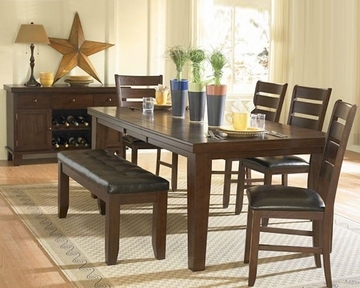 Substantial tapered legs and the birch veneer, in a dark oak finish, complement this simple and refined dining option. The rectangular table is flanked by the perfectly coordinating chair or bench option.